When you find work you really enjoy, and add technology mastery and a passion for great customer service, you can often achieve amazing results. Here in Murphy, NC and Cherokee County, REMAX REALTOR John Poltrock has earned a highly coveted award that speaks of his commitment to excellence. 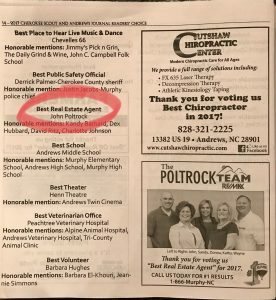 John was just voted Cherokee County’s Best Real Estate Agent in the Cherokee Scout’s 2017 Reader’s Choice Awards. The award is voted on by all the readers and subscribers of The Cherokee Scout, the area’s local newspaper. With over 13 years of real estate experience under his belt, John Poltrock is a highly focused professional who skillfully combines diverse analytic tools with a thorough knowledge of our regional real estate market. Using his Bachelor’s Degree in Financial Planning (from Western Carolina University), John deftly interprets often-complex market and trend reports. He utilizes relevant data to provide his clients with real-world advice that helps them to reach their buying or selling goals. John combines his highly regarded technical expertise with an easygoing manner and a talent for making the most of every situation. He regards each challenge as a new opportunity, and frequently “thinks outside the box” to find the best solution. John’s commitment to client service is second to none, and many home buyers and sellers have happily provided testimonials about their positive experiences with John. Like any high-achieving professional real estate agent, John Poltrock works with a superb support team. While John is The Poltrock Team’s lead Listing Agent, the five-member team also includes a Buyers’ Agent, versatile universal Realtor, Listings Coordinator, Closing Coordinator, and Marketing associate. 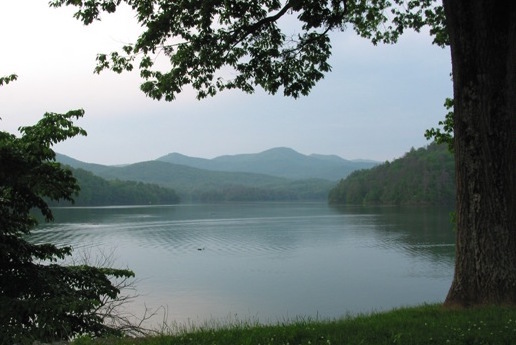 Together, John Poltrock and The Poltrock Team enjoy providing Murphy, NC and Cherokee County with top-notch service while sharing their love of our beautiful mountains. Historic buildings are always good candidates for repairs and restorations. In cities and towns across the country, you’ll find workers shoring up sagging floors, replacing peeling paint, and even beefing up the building’s structure. However, here in Murphy, NC, the Cherokee County Courthouse recently received a rather unusual type of facelift. On the morning of Thursday, January 12, two huge hydraulic cranes lumbered into action on Murphy’s Peachtree Street, just outside the courthouse. 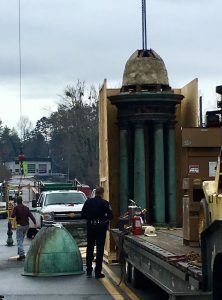 Managed by Cannon Roofing Company, the cranes had a highly challenging task: remove the super-heavy copper lantern from atop the courthouse’s large dome. The word “lantern” is an architectural term, in this case referring to the ornamental structure that has topped the Cherokee County Courthouse since its 1926 construction. First, a crane operator gently lowered the lantern’s dome to the street. Once workers examined the dome, they found that it was only secured by one solder joint, where up to eight joints had originally held it in place. In other words, the dome could have given way at any time, crashing onto the pedestrians and court patrons below. What had caused the joints to work themselves loose? Most likely, the dome’s waving American flag, followed by a copper American eagle, had created sufficient windage to negatively affect the dome’s structural integrity. Next, an even larger crane plucked the much taller lantern from atop the building’s dome, and brought it safely to the ground. Constructed of eight 10-foot-high hollow copper Greek columns, the metal lantern is certainly a grand-looking structure. However, it’s also the subject of a mystery: the lantern is chock full of rifle bullet holes. The lantern repair’s unusual nature is the latest chapter in the courthouse’s unconventional history. In fact, the current building is the latest in a series of structures, the first of which was supposedly burned by Federal troops during the Civil War. Two more courthouses suffered the same fate, with the last one falling victim to fire in 1924. In 1926, Cherokee County commissioners approved construction of the current courthouse. Designed by James J. Baldwin, and built with a veneer of imposing Blue Marble from nearby Marble (of course), the two-story Neo-Classical Revival-style courthouse easily commands your attention. 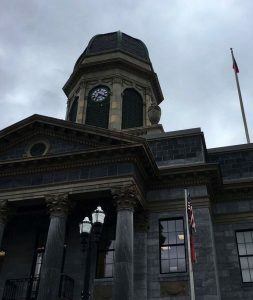 Inside, the ground floor is home to numerous offices, while the expansive second-floor courtroom features finely crafted woodwork and plaster furnishings. However, the Cherokee County Courthouse’s most dramatic feature is the two-story cupola that soars high above the entrance pavilion. Above the cupola’s lower stage, you’d normally see a striking large domed roof, topped by the lantern and smaller dome. With the lantern and small dome missing, though, the building looks strangely out of proportion. Of course, getting the lantern on the ground was only half the battle. To safely contain the cumbersome structure, Cannon Roofing workers had constructed a massive wooden box, which arrived atop a flatbed truck. After workers buttoned up the lantern for transport, the truck headed for Andrews-Murphy Airport, where skilled craftsmen would perform repairs inside an aircraft hangar. Not surprisingly, fixing the 91-year-old copper lantern will be quite expensive. The Cherokee County government will soon issue a request for repair estimates, which should be the subject of much discussion around town. After the lantern repairs have been completed, workers will carefully reattach the copper eagle to the dome. Fittingly, this symbol of American liberty and freedom will soon resume its watch over downtown Murphy, NC. It’s hard to believe Western North Carolina is experiencing so many wild fires. As you drive through Murphy, the smoke is so thick, its hard to see in some places. Although there are no fires in Cherokee County NC (and I hope we have none), the area is experiencing a 100+ year drought. I spoke with my mother-in-law and she does not recall it ever being so dry in our beautiful mountains. I went to Hayesville NC on Veterans Day and had the privilege of watching so many incredible folks try to put out the fires that our plaguing our area. I literally saw a dozen helicopters fly to refill and drop water on raging fires over and over and over again. There are so many heroes who have fought these fires and saved so many homes. I saw smoke that was 100 yards from a home and I can’t imagine the fear and concern some people have for their dreams. Please keep your prayers up: both for rain and for the brave men and women working so hard to eliminate the fires. 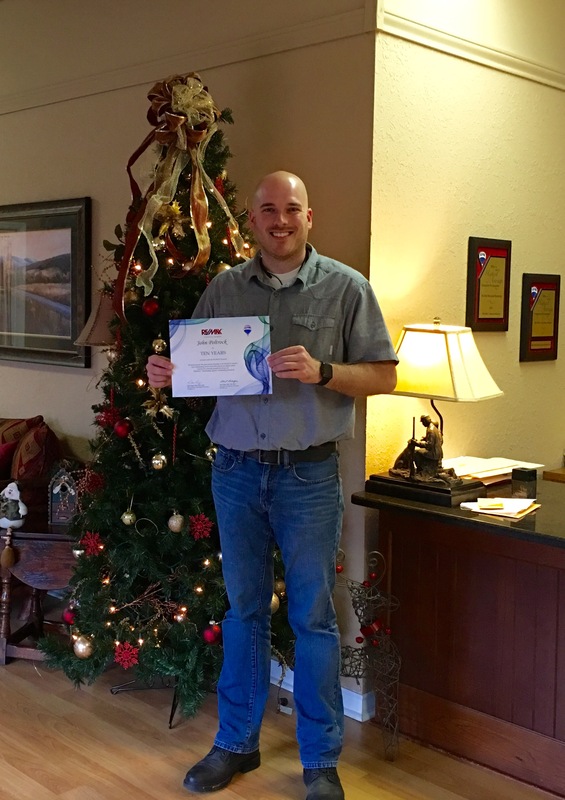 It’s hard to believe – I’ve officially been with REMAX in Murphy NC for 10 years! It’s been an incredible opportunity and a lot of fun. I have met wonderful people who I will never forget. I’ve sold hundreds of homes, as many parcels of land, and went from “Rising Star” with the Mountain Lakes Board of Realtors shortly after I first started real estate here to the top Realtor in the area. Everything started with Jessica and I getting married 10 years ago – that’s right – my marriage anniversary and RE/MAX anniversary are literally a few days apart! Thank you to every person who I’ve worked for and with – I am thankful for and enjoy every day and look forward to 10 more years! I couldn’t be happier than to call Murphy NC my home and real estate my career. The Poltrock Team is HERE! Wayne Cofer is in the pink shirt and Donna Srabian is on the back row, second from left. 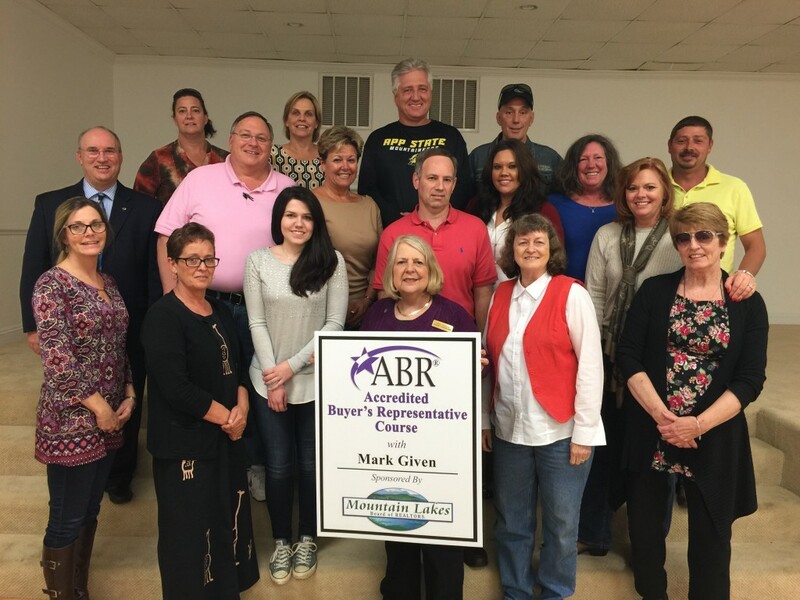 The Accredited Buyer’s Representative course, or ABR, is designed specifically for Realtors who work with home buyers. It is produced by the National Association of Realtors and was sponsored this week by the Mountain Lakes Board of Realtors, which is our local Realtor organization. It’s a great course to make certain real estate agents are on the cutting edge of technology, education, and experience to ensure those who buy real estate have a true professional represent them in the buying process. 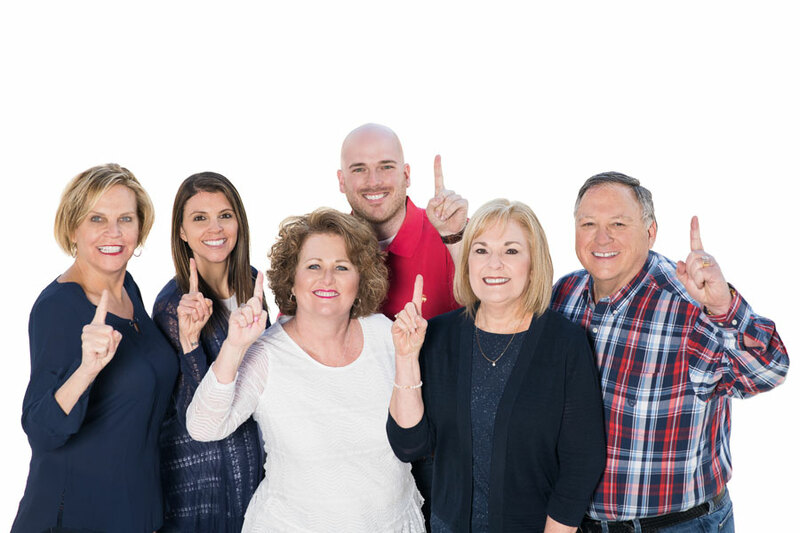 What is also great is that not only Donna Srabian and Wayne Cofer of The Poltrock Team at RE/MAX, we also have other RE/MAX agents from Murphy NC! Randy Dockery, Amity Ledford, and Lori Curtis also attend and pass the course. If you’ve missed your overnight visits to Hanging Dog Campground – just a stone’s throw from Murphy, NC – you’ve probably missed more than the gorgeous scenery on Lake Hiwassee or nature’s sounds. You’ve been pining away for that bacon sizzling on your camp stove each morning – and your piping hot coffee that helps you clear the cobwebs after a good night’s sleep. Well, air out that tent and sleeping bag, because Hanging Dog will reopen to overnight visitors for the 2016 season! To get new residents and visitors up to speed, Federal Forest Service officials closed Hanging Dog Campground in 2014 because of increasing operating costs and fewer visitors. Although the Recreation Area’s day use facilities are still available, we were all disappointed at losing our overnight camping spot. In fact, we heard rumors of desperate campers sacking out in their pickups or camping in their yards – they just missed the feeling of sleeping in the great outdoors. Fortunately, our Cherokee County Commissioners have been working behind the scenes to turn this unfortunate situation around. They’ve spent considerable time huddling with the Forest Service, and have also gotten support from United States Senators Richard Burr and Thom Tillis and United States Congressman Mark Meadows. 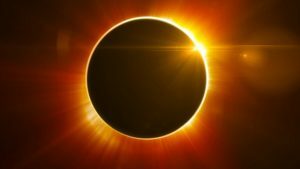 North Carolina Representative Roger West and North Carolina Senator Jim Davis have also helped to grease the wheels on this worthy effort. As we write this, the Commissioners and Forest Service are hammering out the details of an overnight camping agreement for the 2016 season. As you might expect, Cherokee County will allocate some funds to upgrade the overnight facilities and perform seasonal maintenance work. Even better, the Commissioners are eying future collaborations with the Forest Service, with the goal of expanding recreational opportunities on Forest Service lands. However, this groundbreaking news comes with one huge catch. If we want Hanging Dog Campground to be open for overnight camping beyond 2016, we must really throw our support behind it. In other words, start planning those overnight camping trips right now and get out there an USE IT! Get your friends and extended family together, or plan a “get away from it all” weekend for yourself and a special companion. Pass the word on your Facebook page, and post a notice on the community bulletin board. Finally, book that coveted campsite when the website’s reservation portal opens. Remember, the Forest Service is keeping a close eye on this Murphy, NC landmark – for all the right reasons. 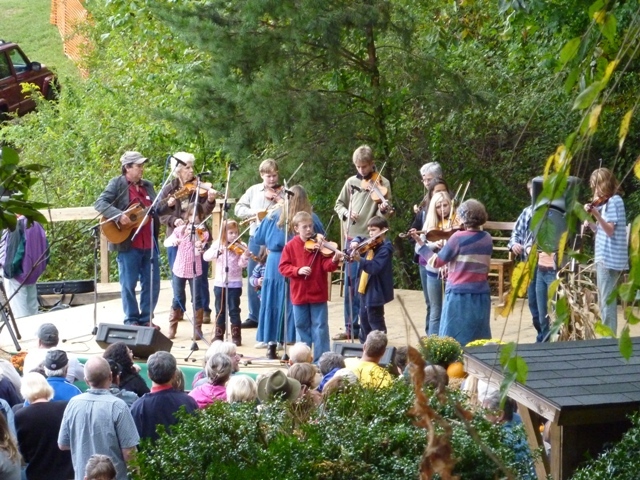 If you’re always ready for a good mountain craft festival, and you want to enjoy our drop-dead-gorgeous fall colors, come check out the famous John C. Campbell Folk School Fall Festival. This almost-legendary event takes place near Murphy NC, in a charming little place called Brasstown NC during the first weekend in October. 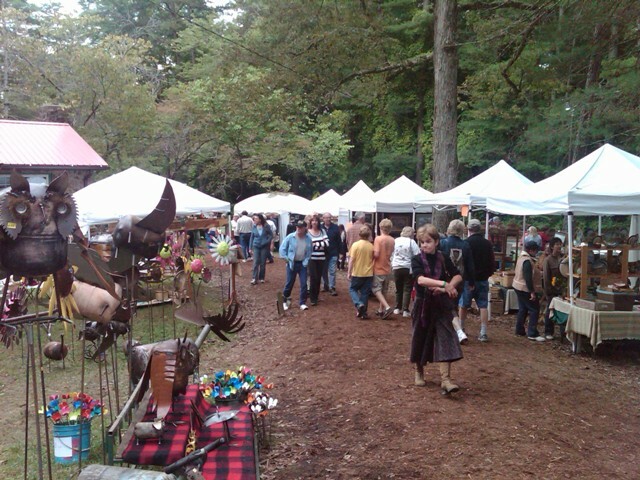 This year’s Fall Festival will be held on October 3 and 4 from 10 a.m. to 5 p.m. In fact, this is quite a special gathering, as the Folk School celebrates its 90th Anniversary in 2015. 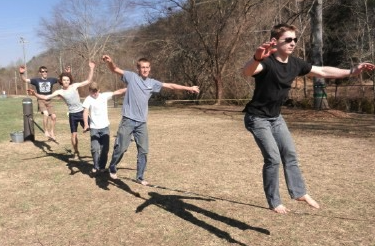 When you arrive on the Folk School campus, park your vehicle and put on your walking shoes. Start meandering along the tree-lined paths as you visit over 240 craft vendors who are happy to share their work. You’ll see fine-quality basketry, glass, ironwork, jewelry, painting, custom knives, pottery, weaving, woodturning, and woodworking…plus some interesting crafts you’ve never seen before. If you’re a hands-on person, come watch over 40 traditional and contemporary craft demonstrations that provide a taste of our region’s Appalachian culture. I love hearing the violins every year! near the Craft Shop, will host quite a lineup of regional musicians and dancers. Come hear country, old time, bluegrass, gospel, Celtic, French, and blues songs throughout the weekend. The Appalachian cloggers and Morris dancers will wake up your sense of rhythm, and you might even start swaying to the music while you watch. Kids will also discover plenty of fun Fall Festival activities. Pony rides and face painting are always a hit, and the Cherokee County Arts Council will tempt younger festivalgoers with some exciting crafts projects. Inside the group’s tent, budding artists can dabble in paper arts, fabric collages, painting, felting, and whimmy-diddling, just to name a few. Naturally, you’ll work up an appetite while you browse craft vendors and dance to the live music. Good thing the Fall Festival has lots of lunch, snack, and dessert foods for every taste. Even better, all proceeds support local non-profit and community groups. That’s a “win win” for everybody! What are you waiting for? 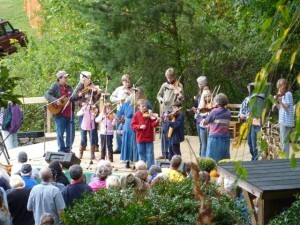 Get on down to the John C. Campbell Folk School Fall Festival, just a stone’s throw from Murphy, NC and Cherokee County. We just might see you there!